If you’re a serious homebrewer, you know the importance of proper pH during the brewing process. Use these calibration solutions to keep your pH meter reading accurately before each brew. Includes 4oz each of 4.00 and 7.00 buffers. We package these solutions from bulk quantities to get you the best pricing. For testing, pour buffers into a small glass. You do not want to stick the probe of the pH meter into the buffer jars directly because you will eventually sacrifice the accuracy of your buffers. Click here for a PDF of the MoreManual on proper pH Meter care. Why did I pick this? Because I like to calibrate my pH meter before taking a reading. It fits my homebrew process management needs. I like fresh calibration solution each year. This is the right quantity for me. Oops, didn't intend to pick this. I just wanted the PH to 7 I didn't want the other bottle.How many ounces..
Can't know your pH if the meter isn't calibrated. Generally buffered pH solutions are trustworthy for a year or so and mine are getting old. These help pH meters calibrate. It is necessary to calibrate my pH meter. If you really need to ask why you need calibration fluid, pick up a book. The volumes of buffer standards were far smaller than I expected. Expensive for what was sent. Wish they were NIST rated. PH meter was probably the best investment for my brewing. Need to have this to keep it the meter in line. Good price and product. Always keep a set around and calibrate every time you brew. It helps give you a repeatable product. Just buy it, you'll need it to calibrate your pH meter correctly. I use this product to calibrate meters I use in my printing business, brewing and pool maintenance. This is a great price for very needed solutions if you own a PH meter. At the LHBS we have to pay 5 times as much for smaller bottles of PH solutions 4 and 7. Summary says it all. If you have a pH meter, you should get some. I gave this 4 stars only because it has a shelf life so if you don't brew too often, take note. For me, the shelf life hasn't been an issue because I usually use up all the solutions well before the 6 months. If you own a meter, you gotta calibrate it often. I do it every brew which is probably the best bet. I just purge the air out with inert gas such as Nitrogen or CO2 while screwing the cap back on. This will help extend your shelf life! It's Ok to purge with nitrogen but CO2 is a bad idea. It's not inert, it will dissolve in water and push down the pH. Likely the reason why buffers go bad is that they pick up CO2. This is the reason that sodium hydroxide goes bad over time. All pH meters need to be calibrated regularly (heck ANY measurement device needs calibration have you calibrated you hydrometer - you might be surprised what you find!). 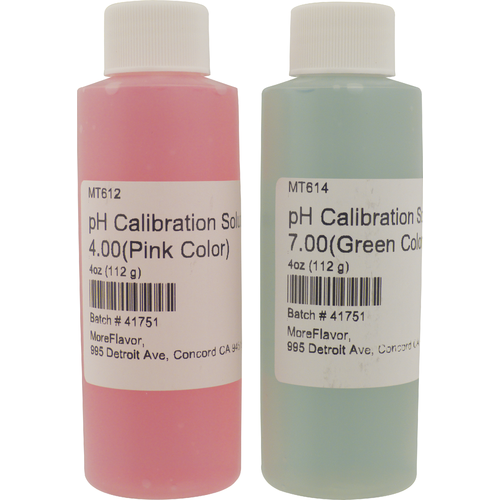 If you're not calibrating a pH meter with both high and low pH solutions you will not be getting accurate results. Wish it had a longer shelf life. It is a good size for moderate recalibrations. The shelf life of these solutions is only 3 to 6 months, so there is no benefit to buying in bulk. I feel like I have enough that there is no fear of running out, without feeling like I'll be tossing away most of it in 6 months. This solution has allowed me to monitor ph during my brewday with great accuracy. The 3 month shelf life can be a bit of an inconvenience, but considering you need a decent amount of liquid each time you calibrate the meter, you'll move through the stuff pretty frequently if you calibrate often. Keeps the pH meter honest. I have mine in the fridge, not sure if helps keep shelf life up but oh well. nuf said, but it here you won't find a better price that works this well. These are great solutions for any pH monitor. I bought these to calibrate my Milwaukee pH Meter I had to intialy calibrate the meter. The solutions worked just fine. Super afordable, will be buying again some time in the near future. Works as advertised and there is more than enough solution to last the few month useful life.